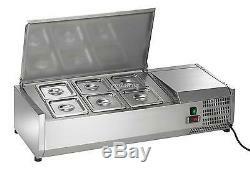 NEW Arctic Air 40in Refrigerated Counter-Top Prep Unit - ACP40. 973 Arden Way Sacramento, CA 95815. Arctic Air's food prep units are designed to bring you real, commercial foodservice grade performance at a truly incredible value. All Arctic Air products are tested to NSF Standard 7 levels and must pass numerous quality control inspections throughout manufacturing process. This food prep model is beautifully designed in smooth stainless steel for a look that you would be proud to put in any commercial application. Includes stainless cover for refrigerated area. Interior cabinet consists of full stainless steel liner. Exterior cabinet consists of full stainless steel shell. Self-contained capillary tube system using environmentally friendly CFC free refrigerant (134A). Includes 1/6 size stainless pans and covers. Electronic thermostat with external digital LED display for accurate control and easy reading. Tested to NSF Standard 7 requirements for open food storage. All Arctic Air products come with full one year parts and labor warranties. Pan Capacity: (6) sixth-size pans. Temp Range: +33°F to +41°F. International Customers: We will Declare the full Value of the item. We will not declare as a gift. Cullincinirestaurantsupply does take responsibility for charges cause by importing product into the customers country. This paper finalizes the contract between shipper and receiver. It is a means by which the trucking company can verify that the merchandise has reached its final destination. If you do not inspect before signing you are, for all practical purposes, waiving the right to collect on a damage claim even if the damage is discovered later (known as concealed damage). With a loading dock, A commercial address is an address which has been determined as such by your local zoning and planning commission; typically a restaurant, bar, hospital, retail store, warehouse or industrial facility. Most home businesses, Churches, day care facilities, or mobile food facilities are not commercial. We Understand That from time to time the need to return and item may Occur. If items are damaged in Transit Please notify us within 24 hours of receiving the Package or no claim will be allowed. Please take care in selecting special order items. Special Orders and non-stocked items are not returnable or refundable. Having maintained a working relationship with thousands of restaurants, bars, stores and institutions over the past five decades, Cullincini's has established itself as a dependable and knowledgeable resource for equipment and supplies. Treat the customer with respect and offer fair pricing. Third generation Restaurant Supply Company with vast product knowledge. The item "NEW Arctic Air 40in Refrigerated Counter-Top Prep Unit ACP40" is in sale since Monday, October 26, 2015. This item is in the category "Business & Industrial\Restaurant & Food Service\Refrigeration & Ice Machines\Coolers & Refrigerators". The seller is "cullincinirestaurantsupply" and is located in Eden Prairie, Minnesota. This item can be shipped to United States.